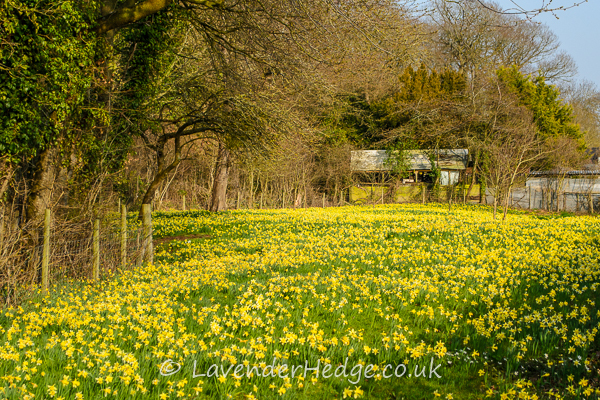 Fortunately, good conservation practices by local farmers and landowners as well as Gloucestershire Wildlife Trust, have preserved some special sites where wild daffodils are flourishing in abundance and are a glorious sight in Spring. 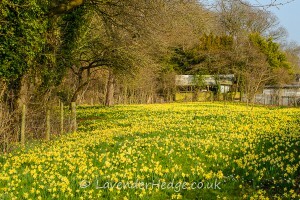 Below are some of the best locations to see the wild daffodils in the Golden Triangle area in Gloucestershire. Enjoy the spectacle, but please remember it is now illegal to pick the wild daffodils. This circular route of ten miles, is a popular way to enjoy the wild daffodils in the Golden Triangle. 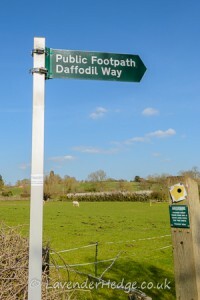 The Daffodil Way takes you along public rights of way, through meadows, orchards and woods. A Daffodil Way map can usually be purchased from local shops, as well as Dymock church, it helpfully marks out the shortcuts you can take if you can’t manage the whole walk. Managed by Gloucestershire Wildlife Trust (GWT), this ancient wood is a Site of Special Scientific Interest (SSSI) and part of Dymock Woods. Other wild flowers to see here are wood anemones, primroses and bluebells as well as plenty of wildlife. Located at Four Oakes, near Oxenhall, Gloucestershire. Click for location. 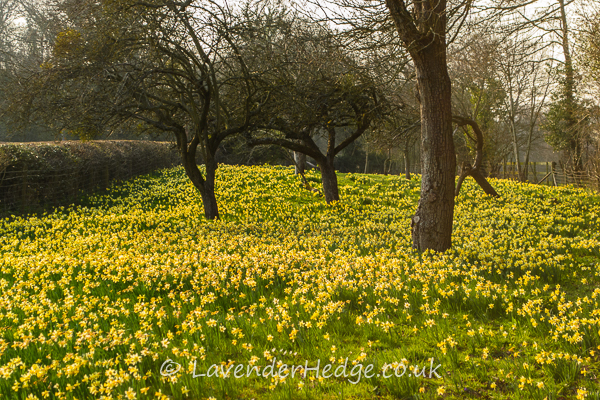 These are two of Gloucestershire’s finest daffodil meadows, named after the owners who donated them to the GWT. It is believed they were once created from roadside common land where the owners would have grown fruit and vegetables. 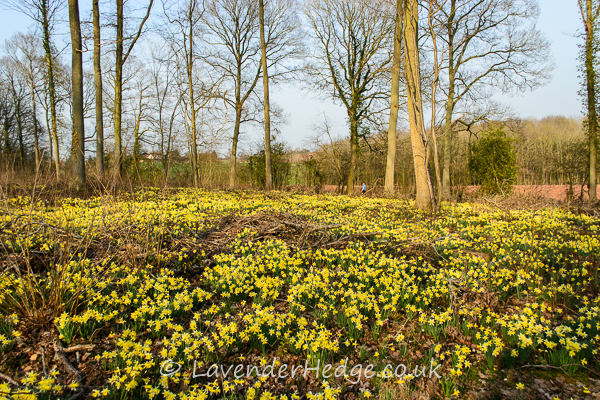 When the cottages were demolished and cultivation ceased, daffodils and other ancient woodland wild flowers spread from the Greenaways wood-bank. The Reserve contains a number of interesting old varieties of fruit trees, including Ellison’s Orange apples and Red Longdon cider pears. GWT requests visitors view this nature reserve from the gates to prevent damage to the wild flowers. Located near Oxenhall, Gloucestershire. Click for location. 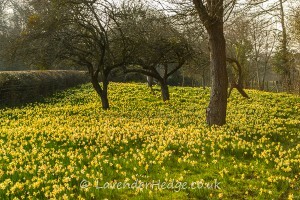 Another fine example of wild daffodil meadows that were once a common sight in this part of Gloucestershire and is now managed by GWT. Located half a mile east of Dymock, it is on the route of one of The Dymock Poets’ Paths. Click for location. This small, steep sandy bank, was acquired by GWT in 2010 who removed lots of scrub and bracken that had threatened to take over the site. Also on one of The Dymock Poets’ Paths, located between Redmarley and Dymock. Click for location. The woods and meadows managed by Gloucestershire Wildlife Trust may be visited at any time (subject to their conditions), but there are daffodil weekends organised by the villages of Dymock, Oxenhall and Kempley, when there are guided walks, as well as maps of the local areas showing routes and sites of interest, so that you can walk at your own pace if you wish. Throughout the weekend, local guides take groups of visitors on a variety of walks of varying lengths. 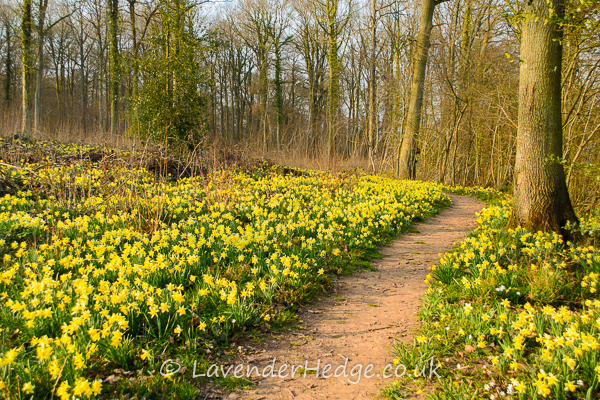 Most of the walks are suitable for all the family and you will get the chance to see the beautiful wild daffodils in Kempley Daffodil Meadow, a Site of Special Scientific Interest. There is also a landscape history amble which includes interesting facts about the history of the village of Kempley. 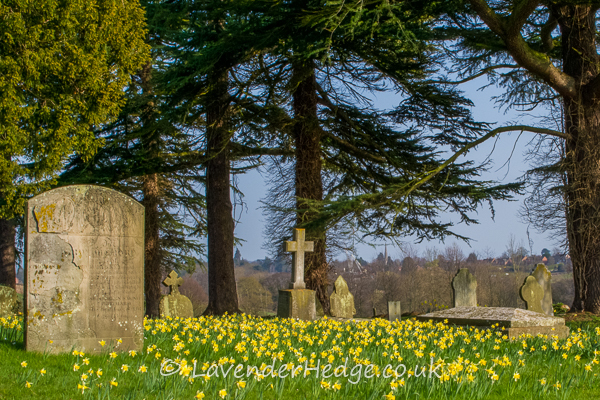 As well as the daffodil walks there will be exhibitions by village groups and a plant stall in the grounds of St Edward’s Church. The old parish church of Kempley, St Mary’s, will also be open for visitors to view the ancient frescoes. The ‘Daff and Ride’ bus operates every 20 to 30 minutes to take visitors around the village. Teas and cakes will be available in the Village Hall. Parking available near the Village Hall. Date: Saturday 19 and Sunday 20 March 2016. Click here for details. 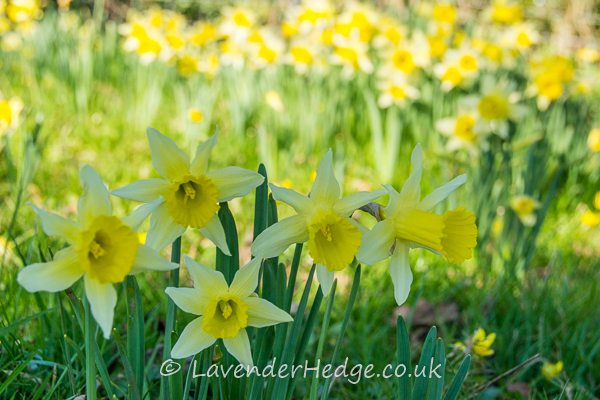 Enjoy one of the guided walks to see the wild daffodils or alternatively, you can get at map from the Village Hall and walk at your own pace. Refreshments served in the Village Hall on both days. Date: Saturday 19 and Sunday 20 March 2016. Car park location: Four Oaks, Oxenhall, Gloucestershire GL18 1LU. Click here for details. 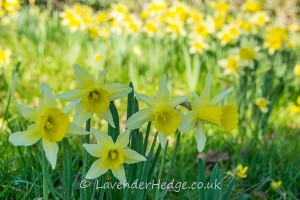 Guided walks to see the wild daffodils each day, of approximately an hour duration. A map is available for those who want to explore at their own pace. Spring fayre in the Parish Hall, as well as refreshments. Date: Saturday 26 and Sunday 27 March 2016. Click for details. Whilst in Dymock, it’s worth checking out the permanent exhibition in the church which gives information about the Dymock Poets who lived in the area just before the First World War: Lascelles Abercombie, Rupert Brook, John Drinkwater, Robert Frost, Wilfred Wilson Gibson and Edward Thomas. ©2016 Lavender Hedge – This article was written by me for the Gloucestershire Oracle in 2013 and may not be copied without my express permission.